Whether you are looking for a quick one-shot game, or are searching for the perfect adventure to kick off your new 4R campaign, In Search of Adventure delivers. 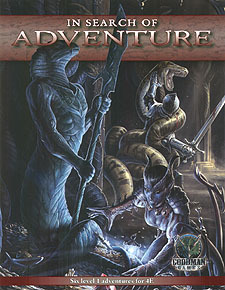 Collected for the first time: six all new level one adventures by some of the brightest writers of the new edition! From the ancient temples of a forgotten snake god, to the maddening maze of an exiled fey, this collection will test even the most cunning and courageous of heroes. If you;'re looking for great adventures, deadly foes and cunning puzzles, look no further. The Search Is Over!